That's $150 million, based on Peapod's reported $500+million revenue. SKOKIE, Ill. — Peapod’s recent mobile ad campaign aimed at commuters caused a big spike in the use of the retailer’s shopping app. Over the past year, the online grocer saw a 50% increase in orders involving a smartphone or other mobile device. About 30% of all visits to Peapod.com involve a mobile device. The growth was driven in part by a 12-week campaign that began last October and combined advertising with mobile technology and mass transit. Working with a number of national consumer brands, Peapod installed “grocery aisles” using billboards at train stations in Philadelphia, Boston, Chicago, New York, Washington DC, New Jersey and Connecticut. On the East Coast, the billboards featured coffee, condiments, soft drinks, snacks, cereal and other common grocery products. As they waited for their trains, mobile users could scan a QR code on the billboard to download Peapod’s free shopping app. They then used the app to scan product barcodes to purchase items, and scheduled delivery. The retailer teamed with Barilla, Coca-Cola, Kimberly-Clark, Procter & Gamble and Reckitt Benckiser on the virtual stores. According to Peapod, commuters who used the app typically spent at least $10 more than those who placed orders on their computer. 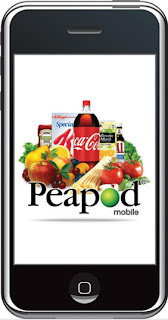 “This means more, better shoppers buying CPG brands via Peapod mobile,” the retailer said. The biggest orders came from those with Apple devices. On its Facebook page, Peapod noted that more than 80% of mobile visits come from Apple devices, with 40% from iPads alone. Peapod is tuned into mobile at a time when consumers are using portable devices more frequently. According to an estimate from eMarketer, the amount of time consumers spent using their phones, tablets and other gadgets for a variety of activities, excluding talking, was expected to grow 51.9% in 2012 to an average of 82 minutes per day, up from 34 minutes in 2010. Peapod will target shoppers with a new iteration of virtual stores this spring. Its initiatives indicate e-commerce is making a comeback, one observer said. “E-commerce in grocery is re-emerging as a strategic initiative following the blow-ups of Webvan” and others, said Jim Hertel, a managing partner at Willard Bishop. Though the audience is limited, retailers are working to expand the market for e-commerce, he said.